The good thing about challenges, is you can start them whenever it is convenient for you. I started the whole 30 diet with the plan being so it would be done BEFORE the Deerfield Fair. People. I need Betsy’s donut. I eat one a year and I am not missing this year’s! So if you are just catching this challenge now, you can start today! 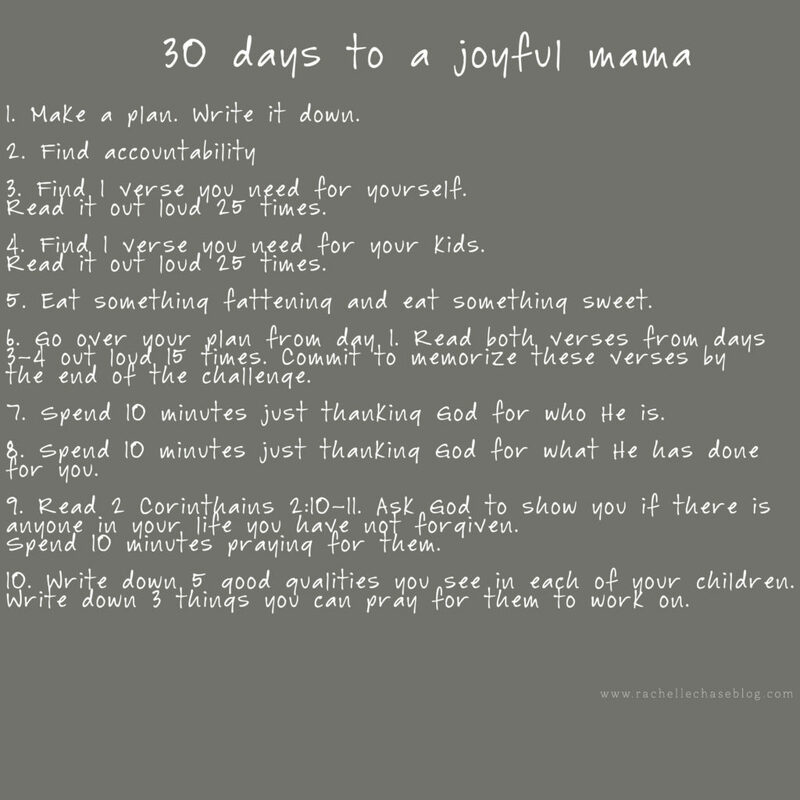 I will be posting days 1-10 today, but going over days 6-10. You can find days 1-5 here if you missed it. Day 6. Go over your plan from day 1. Read the verses from days 3 and 4 out loud 15 times. Commit to memorize these verses by the end of the challenge. Review, review, review. It’s so important to go back over what we wanted our plan to be, because the more time goes by, the less sleep we get and the more exhausted we feel, the more likely we are to just plain forget what we had even started in the first place! Any mama’s with me?!?! Ever walk into a room to get something and by the time you get in there, totally forget what you had gone in there for? Me either. I am asking for a friend. ha! But seriously. We need to remind ourselves of why we are doing this challenge, and what we want God to change in us. Continue reading those verses you selected. Write them down. Put them in a place you see them a lot. And decide that you will memorize them by the end of this challenge. That gives you a whole month from the first time you read them until the end. As you are continuously praying the verses over your kids, you will start to memorize them anyways! Reading God’s Word is important. Hiding it in your heart is incredibly valuable. Day 7. Spend 10 minutes just thanking God for who He is. Sometimes as I have my prayer time with God, I find myself asking for a lot of things, and thanking Him for things. I certainly don’t think there’s anything wrong with that! But sometimes it helps me to think of God as my Father. As a mom, it helps me relate. Because I need to be talking to God like he really is my dad. So while I am really grateful when my boys thank me for buying them things, it is so special when they thank me for being generous, or thank me for loving them, or thank me for something that has to do with my character. Yes. God gives amazing gifts. And I am so thankful that He does! But it’s important to spend time focusing on who He is. He is faithful. He is constant…never stresses out. Always in control. Always good. Find verses that go along with what you are thanking him for. Set a timer for 10 minutes and stay focused! Day 8. Spend 10 minutes just thanking God for what He has done for you. If you’re anything like me, you find your mind wandering as you read your Bible or have your prayer time. Thank you God so much for everything you have blessed me with. We are healthy, we are not going hungry…oh wait. Did I take the chicken out of the freezer for dinner? Oh no, I forgot to buy potatoes last time I was at the store! And on and on my mind can go. Praying out loud can help to get rid of that struggle! Your mind is less apt to wander if you are speaking out loud. It’s ok if your kids are around when you are doing this challenge! It is good for them to hear that you are giving credit to God for all the blessings in your life! He is such a good God and he loves to give good gifts to His children! We are teaching our kids while we push and challenge ourselves. Day 9. Read 2 Corinthains 2:10-11. Ask God to show you if there is anyone in your life you have not forgiven. Spend 10 minutes praying for them. This verse really hit me with the context. It talks about not being unaware of the devices of the enemy. 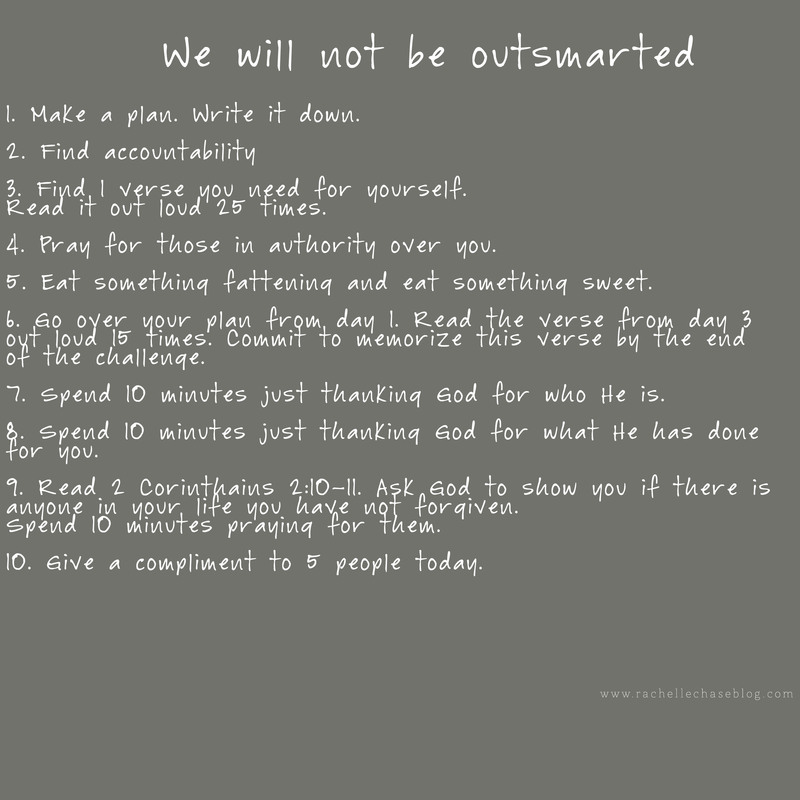 About not being outsmarted. But the context is with forgiveness. I think the reason it interested me is because when someone treats your unfairly, or poorly, it is easy to hold on to it and not even realize you are holding on to it. I have my fair share of “friends” treating me poorly. You can read a little about that here. (although, sadly, I could add to the list since then!) So believe me, I get it. I really struggle when people act a certain way, never apologize, and then go on with their lives as if nothing ever happened. Here is where the enemy can trip you up. Someone wrongs you. They don’t ever make it right. You hold on to it, and start to feel prideful and self-righteous against this person every time you see them. See, we don’t see that last part coming! We are thinking of what they did wrong, how they hurt us and how they should have to pay for what they did! And all along the enemy is getting us to not forgive them and as a result, our prayers are not heard by God! When you think of it that way, you realize that it is not worth it to hold on to your unforgiveness anymore! Forgiveness doesn’t make them right, it makes you free! Remember that! Day 10. Write down 5 good qualities you see in each of your children. Write down three areas you can pray for them to work on. This can be done if your kids are young or old! Even if your child is a baby, you can already start to see their personality! After you write down the good qualities, tell your kids throughout the day today that you appreciate that specific quality about them! Even if they are a baby. Practice speaking life into your kids! It’s so easy to focus on the negative. The complaining, the whining, the things they do wrong. Focus on the good. Speak it into them. Show them what you love about them. When you are encouraging their strengths, they are going to want to continue in those strengths! Also take some time to write down 3 specific things you want God to give them strength working on. Having a foster son has taught me a lot. The seemingly basic things that I taught my boys when they were 2 and 3 were not taught to this little boy! I have had to really stop and think about what areas he needs help with! Just yesterday, he was misbehaving and we told him what he needed to do, and then I just silently prayed that God would give him the strength to do the right thing, to have self control, to be obedient and respectful. Our kids need us fighting for them!! There is no better way to fight for our kids than to storm the gates of heaven on their behalf! Review, review, review. It’s so important to go back over what we wanted our plan to be, because the more time goes by, the busier we get and the more exhausted we feel, the more likely we are to just plain forget what we had even started in the first place! Anyone with me?!?! Ever walk into a room to get something and by the time you get in there, totally forget what you had gone in there for? Continue reading that verse you selected. Write it down. Put it in a place you see it a lot. And decide that you will memorize it by the end of this challenge. That gives you a whole month from the first time you read them until the end. As you are continuously saying the verses over and over, you will start to memorize them anyways! Praying takes practice. I know that sounds weird, but go with me for a minute. We have to develop our relationship with God, just like we would in any relationship. And sometimes, I can find myself filling my prayer time with request and then adding in how thankful I am for the gifts that He’s given me. There is nothing wrong with any of that, But sometimes it helps me to think of God as my Father. Yes. God gives amazing gifts. And I am so thankful that He does! But it’s important to spend time focusing on who He is. He is constant…never stresses out. He is always in control. Find verses that go along with what you are thanking him for. Thank you God so much for everything you have blessed me with. We are healthy, we are not going hungry…oh wait. Did I take the chicken out of the freezer for dinner? Oh no, I forgot to buy potatoes last time I was at the store?! And on and on my mind can go. Praying out loud can help to get rid of that struggle! Your mind is less apt to wander if you are speaking out loud. It’s ok if people are around when you are doing this challenge! It is good for them to hear that you are giving credit to God for all the blessings in your life! He is such a good God and he loves to give good gifts to His children! Day 10. Give a compliment to 5 people today. It is so easy to find the negative in things. I have to admit, I find myself falling into this a lot. When I am making the effort to start looking around at who I can compliment, it helps get my mind focused. I am going to be less likely to complain, and more likely to feel good after I have used my words to speak life into someone! Our tongue has power, people! We can cut people down, or we can build people up! Push yourself on this one! Don’t just compliment the easy, obvious ones…your best friend, your husband, your parents..compliment someone you think could really use it. Maybe even someone you don’t know! And maybe you can even compliment more than 5 people today, and then maybe it will be so much fun, you will start doing it every day! That’s it for these 5 challenges! Keep up the good work! Make sure your accountability partner is pushing you! You are growing to look more like Jesus, and it’s going to look so good on you! « Why would anyone take this away from me?